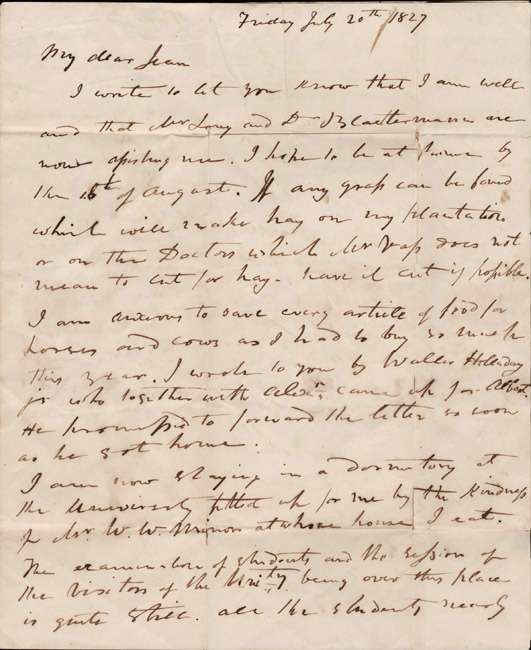 Autograph letter, signed, from John Lewis to his wife, Jean, 20 July 1827. John Lewis never formally matriculated at the University of Virginia. Instead he left his wife and farm in Spotsylvania County in the summer of 1827 to study privately with Professors George Long (classics) and George Blaettermann (modern languages). With the students gone he found the University a quiet place where he could make faster progress than he anticipated. In a letter to his wife he gives instructions on haymaking; briefly mentions regular student Albert Holladay, later a missionary to Persia and president of Hampden Sydney; and concludes, "I must now go to Dr. Blaettermann's to continue the conjugation of German verbs begun yesterday so farewell my dear wife." 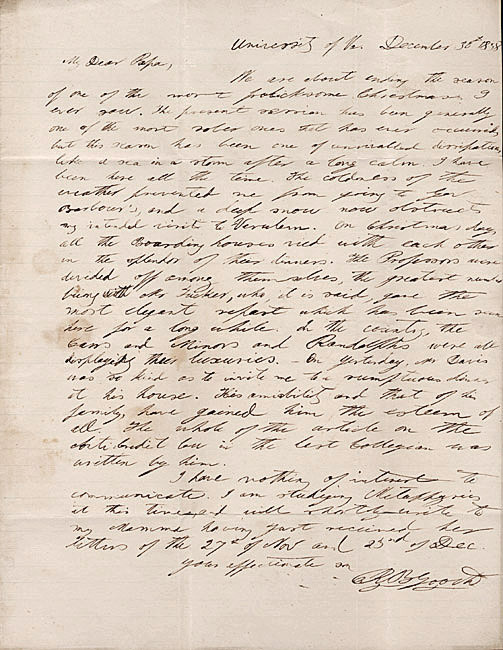 Autograph letter, signed, from Richard B. Gooch to Colonel G. W. Gooch, 30 December 1838. Richard Barnes Gooch, later a Richmond lawyer, wrote to his father from the University in 1838 describing the "frolicksome" Christmas season as one of "unrivalled dissipation, like a sea in a storm after a long calm . . . On Christmas day, all the Boarding houses vied with each other in the splendor of their dinners. The Professors were divided off among themselves, the greatest number being with Mr. [George] Tucker, who, it is said, gave the most elegant repast which has been seen here for a long while . . . On yesterday, Mr. [John A.G.] Davis was so kind as to invite me to a sumptuous dinner at his house. His amiability and that of his family, have gained him the esteem of all." Almost as an afterthought, Gooch mentions that Davis is the author of an article on the anti-credit law and that he himself is currently studying Metaphysics. In answer to Pastor Lapsley's request for President Alderman's opinion "as to the moral conditions pervading student life at the University of Virginia," Alderman, in the letter shown, responds with support for the students at the University. Apparently, the University had some reputation for intoxication and dissipation. In the letter, Alderman explains that there are over 800 students at the University, of all ages and from all places, none of whom are admitted without recommendation as to their good character. While acknowledging the occasional folly and thoughtlessness of youth, Alderman assures Lapsley that he considers "the character and spirit of the student body at the University of Virginia the very finest asset of the Institution." Alderman states his belief that the moral tone at the University is above the average town or city or community. 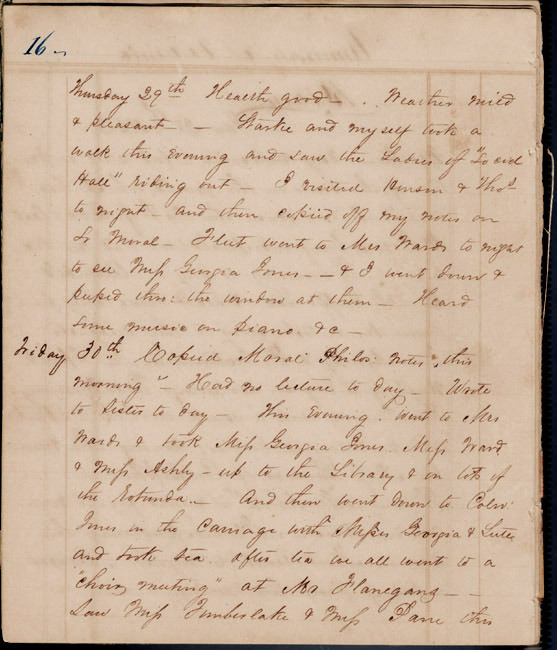 Every page in the 1852 diary of Walter Bowie of 26 East Lawn gives a glimpse into the life of a late ante-bellum student. On January 29, he spied on his roommate who was courting a local girl. The next day, he attended a moral philosophy lecture by William Holmes McGuffey and noted that a noisy "calathump" serenaded Professor William Barton Rogers and Instructor Ernest Volger. Bowie was an officer in the Washington Society and faithfully recorded both their activities including the breakaway of a splinter group to form the Parthenon Society and their debate topics. 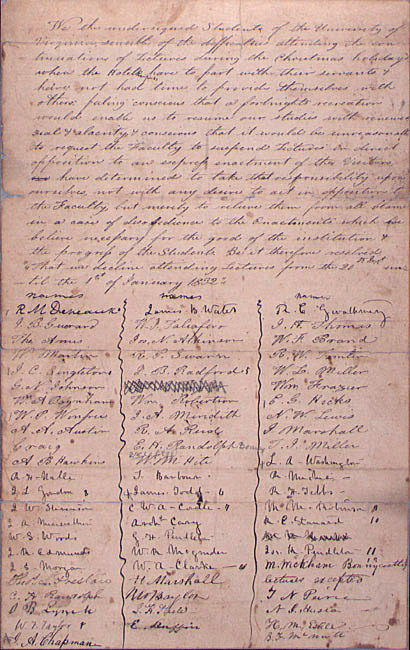 The Society debated such topics as the abstract right of state secession; whether domestic slavery was a blessing; whether the system of free schools should be adopted in Virginia; and whether a dissolution of the Union would be disadvantageous to the South. The society decided affirmatively for the first two topics and against the latter two. After leaving the University, Bowie farmed in Westmoreland County until the Civil War when he joined the Northumberland Rifles of the 40th Regiment Virginia Volunteers, rose to captain, and was severely wounded at Gettysburg. After the war he became Treasurer of Washington College and secretary to its president, Robert E. Lee. 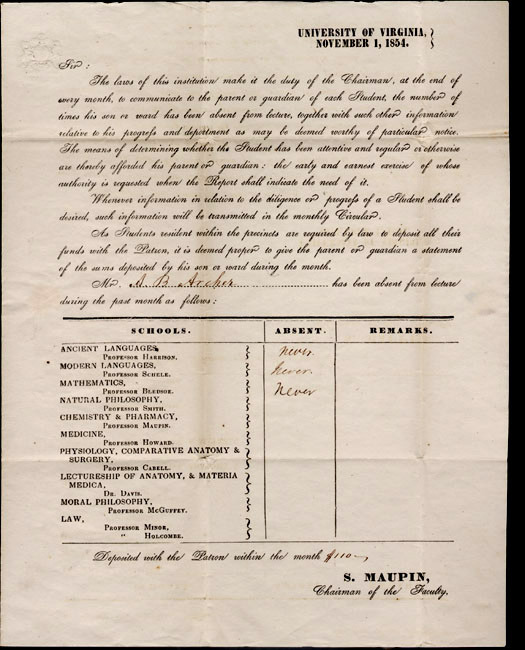 Students signed a petition in 1832 requesting two weeks for a Christmas holiday. Absenteeism report for A. B. Archer, 1 November 1854. Socrates Maupin, as Chairman of the Faculty, issued monthly attendance reports to the parents or guardians of all students. This one, sent to R. T. Archer of Port Gibson, Mississippi, notes that his son A[bram] B. Archer never missed a day of class and that he had $110 deposited with the Patron. The administration and parents alike believed that too much money in the hands of students led to too many vices, particularly drinking and gambling. Students had to place all their funds on deposit and have it doled out to them as necessary, up to a total of $100.00 for clothing and $40.00 in pocket money per session. In fact, in 1838, the General Assembly of Virginia passed a law stating "That no merchant, confection or other dealer, no tailor, shoemaker . . . shall . . . sell or let for hire to any student of the University of Virginia [and of four other Virginia colleges] any goods, wares, [etc.]" on credit. 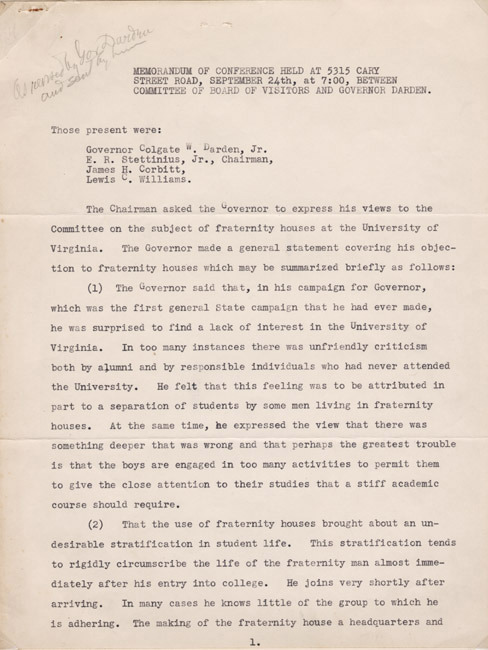 Memorandum of conference between Board of Visitors committee and Governor Darden, 24 September 1942.
Colgate Darden, a future president of the University of Virginia, was elected governor of Virginia in 1941. 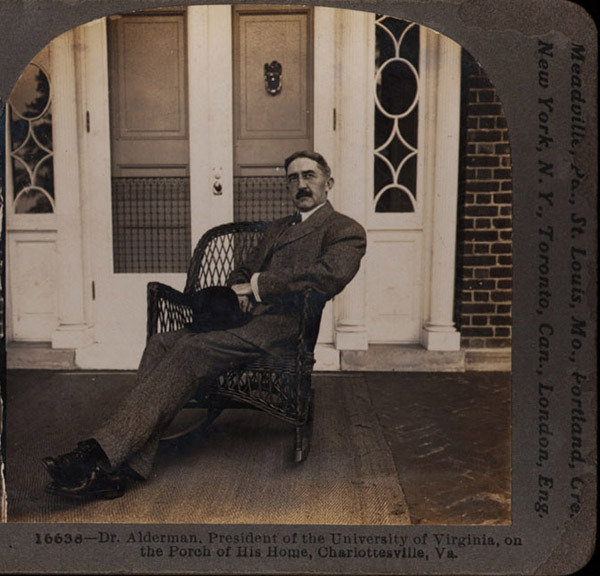 Darden was interested in all aspects of education in the state and was particularly concerned about the exclusive image of the University of Virginia. 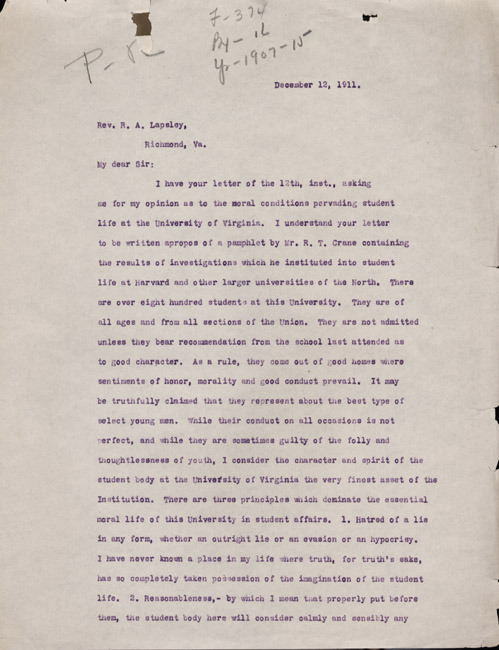 He outlined his plans for reforming the University to a Board of Visitors committee in September 1942, calling for the abolishment of fraternity houses (but not fraternities), the raising of entrance requirements, the dismissal of students with unsatisfactory grades, a banning of automobiles, and a re-evaluation of the role of societies on Grounds. The committee agreed that there was a need for reform at the University but voted against the banning of fraternity houses. They did recommend the construction of a student center with facilities available to all students for entertainment and social events. When Darden was elected third president of the University in 1947, he successfully pushed appropriations for a student activities building, now Newcomb Hall, through the General Assembly and oversaw its completion despite the lobbying and protests of students, faculty and alumni grimly determined to keep all aspects of "State U-ism" off Grounds.